Another feather to SAKEC Hat …………. Shah & Anchor Kutchhi Engineering College is privileged to be selected amongst the few institutes all over India for establishing the Institution Innovation Council (IIC) as per the norms and directions of Innovation Cell, Ministry of HRD, Govt. of India. The objective of formation of Institution’s Innovation Councils (IICs) is to encourage, inspire and nurture young students by exposing them to new ideas and processes resulting in innovative activities in their formative years of graduation. & dignitaries from the Central Govt. agencies on 21st November 2018 at AICTE HQs, New Delhi. Also representatives from various prestigious Educational Institutions and Universities across the country were present for the occasion. Dr. Nilakshi Jain, President IIC- SAKEC & Dr. Kranti Ghag Convener IIC- SAKEC attended the inaugural function. 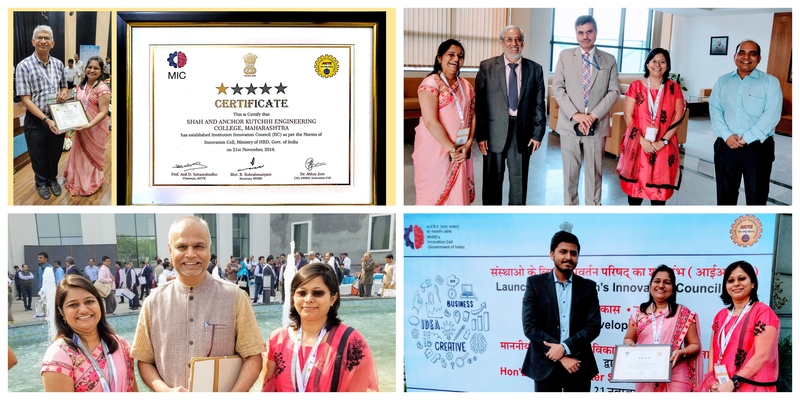 Dr. Nilakshi Jain, President IIC- SAKEC received a certificate of establishment of Institution Innovation Council as per the norms of Innovation Cell, Ministry of HRD, Govt. of India. This is a moment of honour for Shah and Anchor Kutchhi Engineering College.